I actually had time to play along with Karen Giron's Sweet Sunday Sketch Challenge this week! It's been awhile, but when I saw this week's sketch, I knew that I had to play along. I thought the sketch would work well with a Christmas theme, so I went with that. 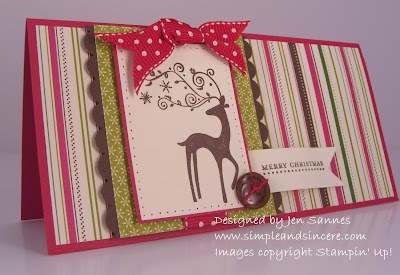 I used some of my Merry Moments dsp and my Dasher individual stamp (only $8.95! ), along with Teeny Tiny Wishes. All those colors have a rich, merry feel. Wow! Jen, your card is FABULOUS!